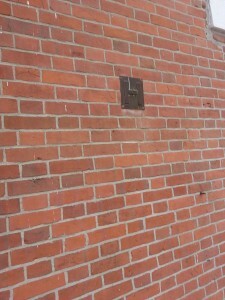 One of the tasks I was assigned as an intern at the Wornall House was to solve the riddle of the bronze “H” plaque. None of the current staff of volunteers and administrators knew exactly what it represented or when it was put there. Archaeologist Doug Shaver did a preliminary investigation over the summer and concluded it was put there sometime between 1890 and the 1930s and it was NOT placed by the NPS for its Historic American Building Survey (HABS) in the 1960s. From experience in old buildings I knew it was not structural, and so did Doug. It was surely commemorative of something. But what? I asked around locally. Nothing. For kicks and a learning experience I tried crowd sourcing. I took it to hundreds of my Kentucky, Indiana and Tennessee relatives and friends on Facebook. There are lots of antebellum homes there. Maybe one of my cousins has seen this. Nada. I took it to reddit.com askahistorian and whatisthisthing. Some insisted it was structural. Hospital? Horse Parking? A tiny vertical landing pad for helicopters? 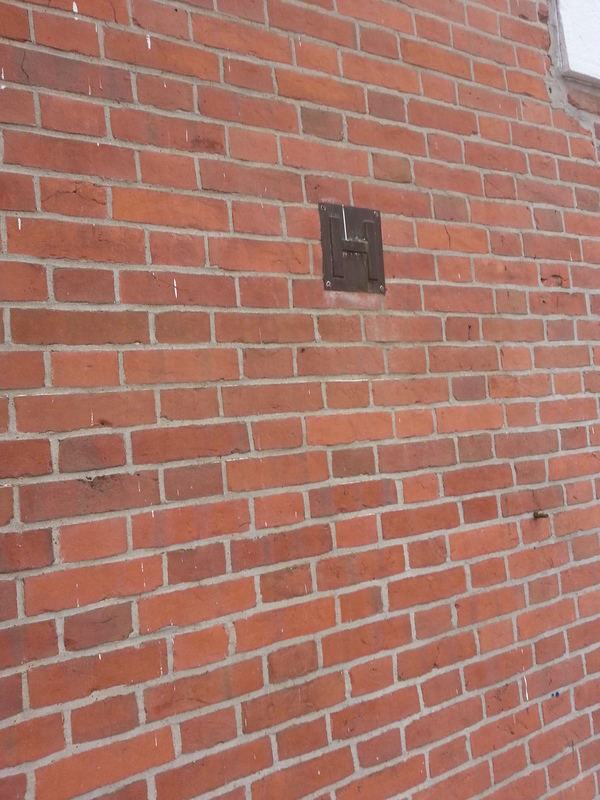 I learned in the UK this “H” plaque is the designation assigned to building with a recessed fire hydrant. I learned that in an episode of “Psyche” there was a button behind a plaque like this in a tourist trap type of museum that shut off a fountain that then allowed access to a secret portal. Very interesting. But, zilch in the hard facts department. I suspected the United Daughters of the Confederacy. They loved placing bronze markers in their hey-day. They have several markers around the KC area and there was a file at the Missouri State Historical Society I was yet to lay my hands on. I finally found the answer, in the last place I looked. The last file in a box at the Jackson County Historical Society contained forgotten facts and documents . It turns out the “H” confused the JCHS for a while too. 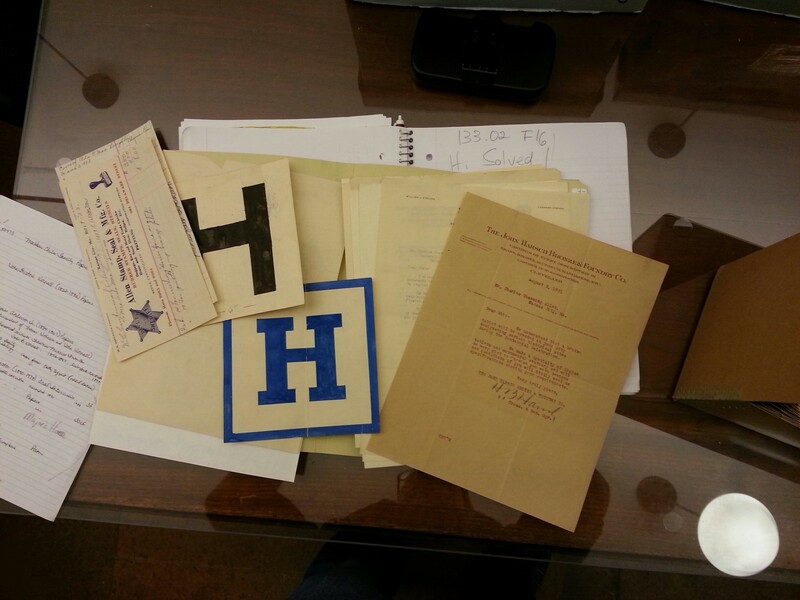 From 1965 to 1985 they apparently had no idea what it was until local historian Kathy Taggart found documents that told the story of the H.
The last place I looked! This entry was posted in HistoryMaking and tagged crowd sourcing for information, Facebook, Jackson County Historical Society, Kansas City, reddit.com, Tony O'Bryan, Wornall-Majors House on April 7, 2014 by Tony Lawson-O'Bryan.